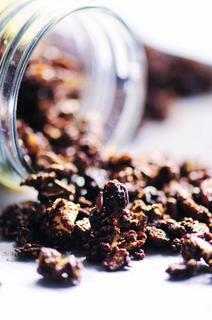 This isn't your standard granola! If you're looking for a bit of an indulgent crunch in your breakfast or as a snack on the go, you're in luck. . . This yummy goodness is rich in flavor, as well as B vitamins, iron and protein! My little one couldn't wait to gobble it up as you can tell from the photo above! It is just that good. If you are a fan of rich, smoky blackstrap molasses (we are!) coupled with a bit of crunch and sweetness, and chock full of nutrients - give this a go! You will love it. I promise! Preheat oven to 275°F. Line a cookie sheet with parchment paper. Set aside.In a large bowl combine ingredients oats through sea salt. Stir a few times until evenly combined.Over medium-low heat, combine molasses, coconut oil and peanut butter. Stir until well combined and heated throughout.Pour molasses mixture over oats mixture. Stir until all is evenly coated.Pour your granola mix onto your parchment lined cookie sheet. Spread out into one even layer. Bake for 40 minutes.Remove from oven and immediately toss with 1-2 tbs coconut sugar.Let cool and crisp up completely before serving.Keep stored in an airtight container at room temperature. Enjoy!